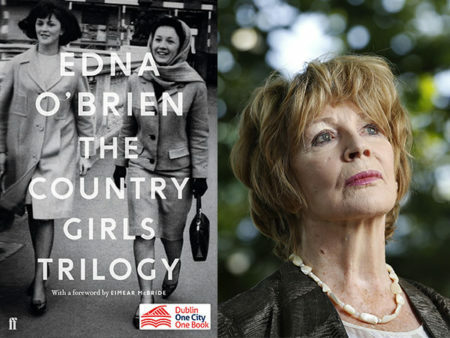 Spend the evening in the company of Edna O’Brien, author of this year’s Dublin One City One Book and one of Ireland’s most treasured writers. Edna will be interviewed by writer Colum McCann about her enormous contribution to world literature. She will be joined by singer Moya Brennan and harpist Cormac de Barra, playing some of her favourite music. Selected excerpts from The Country Girls Trilogy will be read by actor Seána Kerslake. Booking is essential. Maximum of 2 tickets per booking. Edna O’Brien‘s works include 18 novels, 9 collections of short stories, 5 plays, biographies of James Joyce and Byron, a cultural history of Ireland, memoirs and a volume of poetry. She is the recipient of many awards including the Irish PEN Lifetime Achievement Award, the American National Arts Gold Medal, the Frank O’Connor Prize and the PEN/Nabokov Award for Achievement in International Literature. Born and raised in the west of Ireland, she has lived in London for many years. Colum McCann is the author of 6 novels and 3 collections of stories including Transatlantic and Thirteen Ways of Looking. He has won numerous international literary awards and his fiction has been published in over thirty languages. Let The Great World Spin was the winner of the Dublin IMPAC Literary Award and the National Book Award in the USA.. He most recently published Letters to a Young Writer.